Today started off wet but the clouds cleared and it became sunnier the longer the day went on. Very warm when the sun was out too. 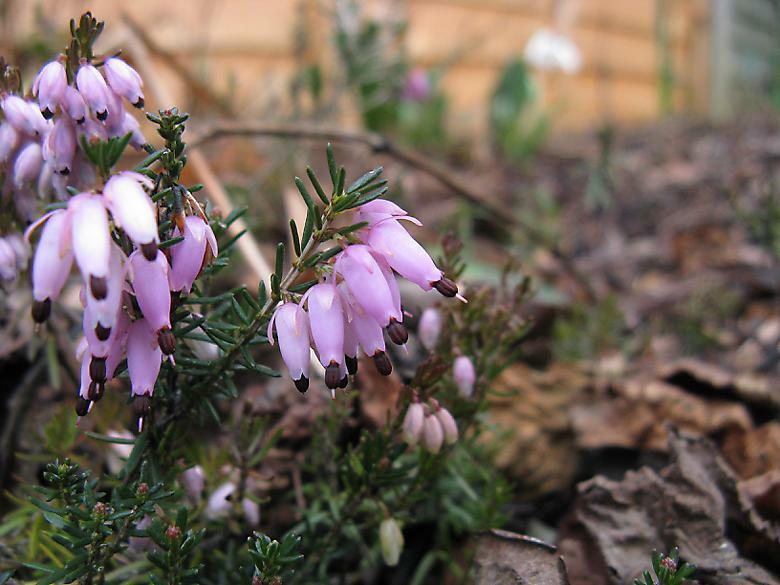 After a break here are six more things that can be seen in the garden this Saturday. I have my first Daffodil flower and to me that means that spring has finally arrived. This is much later than last year, where the first one was out on the 13th March or perhaps a day or two earlier. It remains the only one that is out and it is going to be days before any more join it in the main clump. This is also very different than last year when there were several out within days of each other. 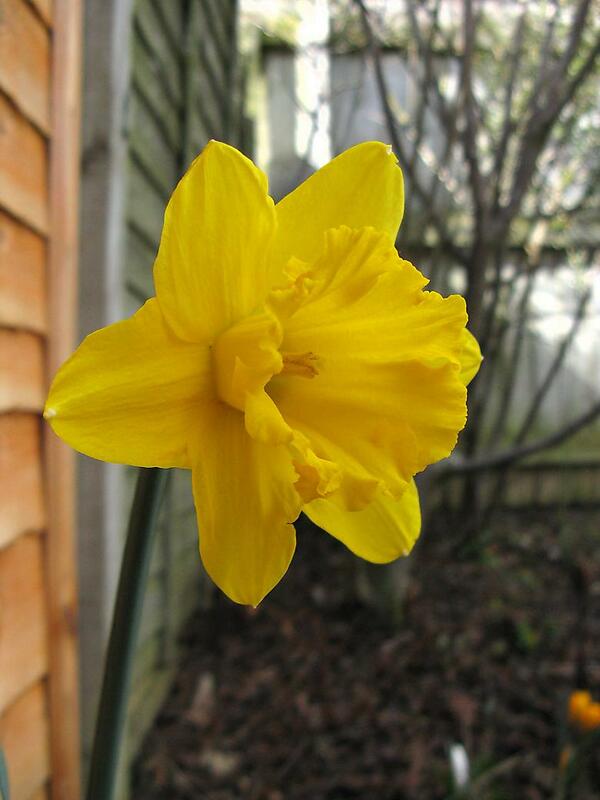 This daffodil was an early starter and its flower bud was clearly visible in the middle of January. It is also the same one that appeared in a previous SoS lying horizontally on top of the snow, it has now fully recovered and is standing very straight. I was a bit envious of several heathers I saw on my walk today. Mine is very small and very low to the ground, but with a bit of close-up photography you can imagine that it looks more impressive than it actually does. 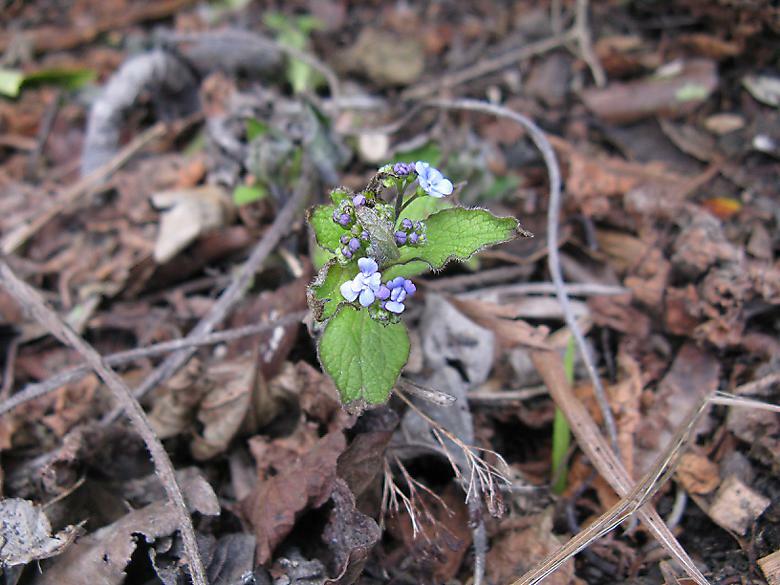 My Brunnera (unknown variety, it was already here) has suddenly started growing. 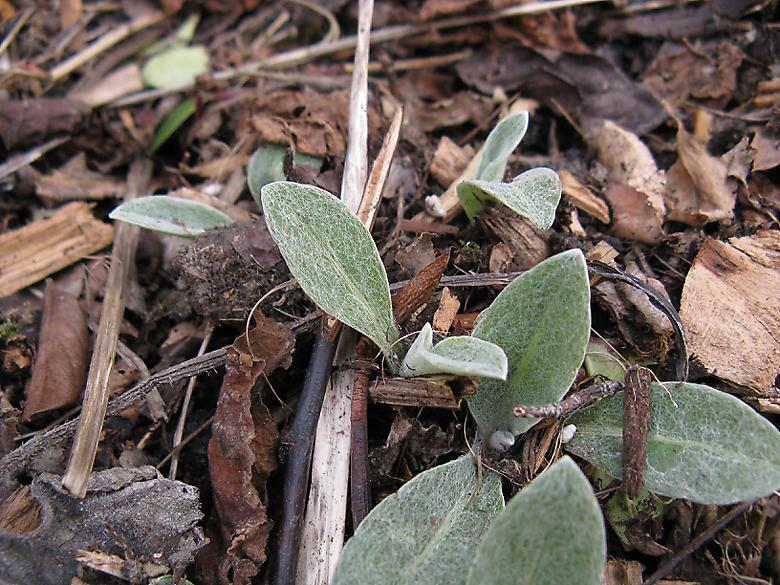 It gets flowers almost immediately and leaves grow to full size later. This year it may have suffered in the cold spells as it is a bit frazzled around the edges; last year it was much more advanced than this at the same time in March. I like the young leaves on this plant as they are covered in fine white hairs. This came with the garden so I don't know its variety, I assume it is C. montana of some kind. It flowered last year in the spring but did not flower again later in the year after it was cut back, so I may divide this and try it somewhere else to see how it does elsewhere. Last week I had some time to wait so popped into Wilko and saw this Rosemary that appeared to be wilting through lack of water. It was reduced to half price, so I just had to get it. The stems are still bent over after watering, but at least they are now starting to point upward at the ends again. 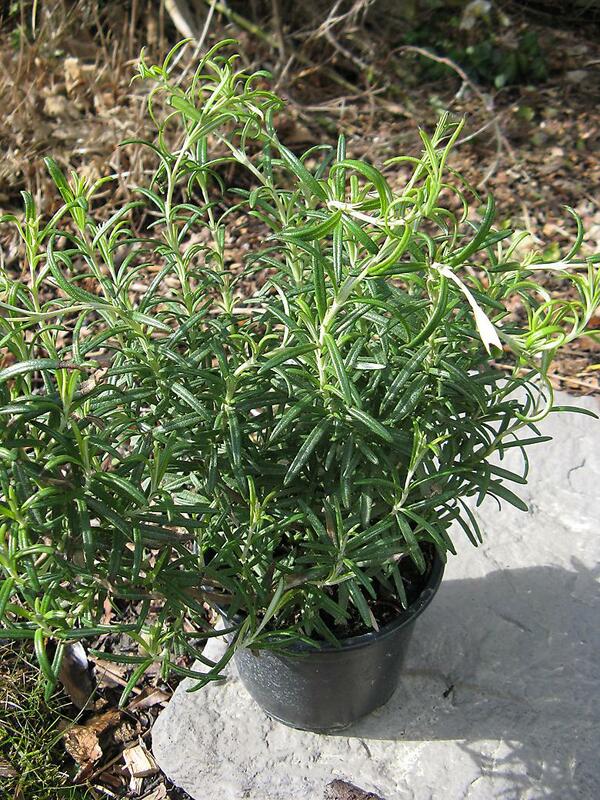 My Rosemary cutting unfortunately died, so I needed a new one which I intend to plant in the garden. 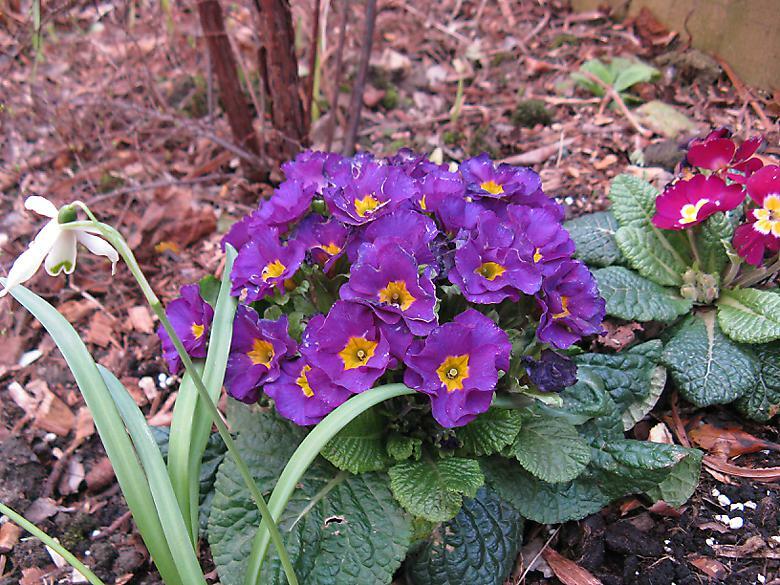 This primrose has appeared before, but is worth repeating as it manages to keep a full head of flowers and seems to be unfazed by all the cold and snow - a trait it shares with the yellow one I have. For more garden snapshots on this day, visit todays blog at The propagator.